(Washington, D.C.) Senator Hillary Clinton, who will tell anyone who will listen and even those who won't that she won the popular primary vote, confirmed she will suspend her campaign for President Saturday, "but I didn't say which Saturday." The latest statement from the Clinton "Kampf", as Ann Coulter would have written because "Billary are Nazis in Democratic clothing", has strategists on both sides scratching their collective heads. The Democratic Party doesn't really know what to make of it, as is evidenced in the statement by long time Clinton supporter Congressman Charles Rangel. "She is definitely going to suspend her campaign, some time in the future, that would be a Saturday, but not this one, which is a good thing, right?" However, House of Representatives Speaker Nancy Pelosi was more certain Democratic unity was near. "Einstein said that time is relative. According to that, Senator Clinton may have already suspended her campaign even before she started it, or she might keep it going even after it ends. No matter how you look at it, you just have to look at it. And looked at that way, I think it's clear who is going to be in the White House come January 2009." While some underground blogs have hinted that the entire Clinton campaign strategy has evolved from the Senator from New York's love of Abbott & Costello, it wasn't until a statement by Clinton campaign Chairman Terry McAuliffe that some credibility was given to the strategy. 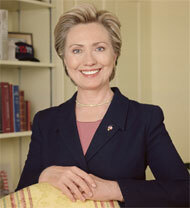 "Yes, Senator Clinton is a fan of Abbott & Costello," said McAuliffe on Wolf Blitzer's "Situation Room. "And here I want to stress that she is a fan of the movies not the television show. And, yes, "Who's On First?" is a great favorite." Blitzer then followed-up,"So, if I may, the blogs, are they correct? The Senator from New York is putting the hopes of the Democratic Party on a burlesque sketch?" To which McAuliffe replied, "I don't know. Third base." Presumptive Democratic Presidential nominee Barack Obama is also weighing in on Clinton's latest strategy. "While the landscape of mid-20th Century comedy is littered with racist humor, to my knowledge Abbott & Costello never sunk to that level. I have the highest regard for them and Senator Clinton." Presumptive Republican Presidential nominee John McCain commented true to his direct manner. "I think it's time for a little straight talk here. First, agreed, the Abbott & Costello movies were, as the youngsters say, "da bomb"; and second, I want to thank Hillary Clinton for electing me President."